I’m not one to make fun. To be honest, we all make mistakes and shouldn’t be persecuted or judged too harshly for them. Well, I guess that would depend on how big the mistake is, right? Either way, for those who have tattoos that they’d rather get rid of, they live life with mistakes that are hard to forget. After all, tattoos are permanent. Here are some great examples of tattoos gone bad! That is, of course, unless you decide to undergo a Laser Tattoo Removal procedure. Thank goodness for such a treatment. It helps people to rid themselves of their poor choices. And according to our online research, there have been many bad choices made in the world of tattoos. Take, for example, the woman who tattooed the name of her favourite hip-hop star, Drake across her forehead! Eeesh! This poor girl made headline news a few months back for all the wrong reasons. I would love to introduce her to a skin care specialist. 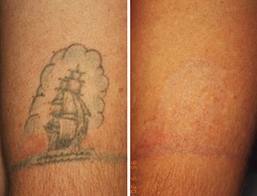 If you have any questions about Laser Tattoo Removal, you too should consult an expert. That way, you can be filled in (pardon the pun) on the Q-Switch Laser. 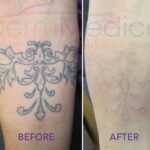 This procedure is popular for removing ink, in addition to birthmarks and brown spots, by using pulses of light energy. The energy works to heat up either the ink or the natural pigmentation to damage it, break it down and have the body replace the cells with new un-pigmented skin. The great thing about Q-Switch Laser treatments is how relatively quick they are. In fact, each appointment lasts an average of just five to ten minutes! However, to assist with the slight discomfort caused by the laser, an anesthetic cream is applied two hours before the treatment. This should be no problem for people who have gone under the needle to get tattoos. I’ve heard that experience is entirely more painful. Recovery time, by the way, is also pretty quick. Within about a week, patients will be back to normal after some understandable irritation to the treated skin area. 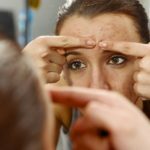 All in all, four to eight treatments are generally required. Not too bad considering that many tattoos – especially the really elaborate ones – take hours on end to be completed. Then again, they say that it’s easier to destroy than it is to build. With that being said, if you wish to destroy a bad choice and remove a tattoo, contact a licensed physician or skin care specialist who offers Q-Switch Laser treatments as a method of tattoo removal. If you’re anything like my friend, Sara, you’ll be glad you did!